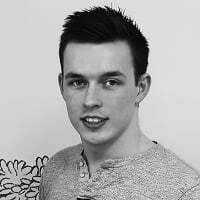 Discussion How can I troubleshoot custom CI not showing up in Dynamic Data OData feed? How can I troubleshoot custom CI not showing up in Dynamic Data OData feed? I've created a custom CI that has been working well for a few weeks in the SCSM Console directly. 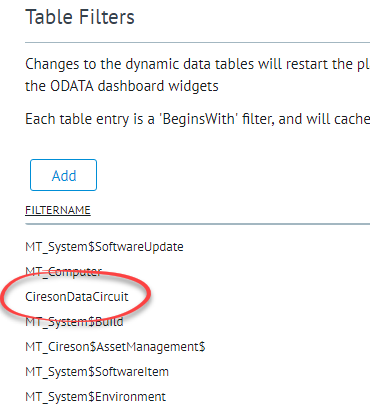 Today I tried adding the CI class to the Dynamic Data table filters list, but no matter what I do it never shows up in the OData API. I've confirmed the table name from the database, I've reset the cache, restarted Cache Builder numerous times and it will not show up. I've also tried several different browsers to make sure that wasn't the issue. What else can I look at to troubleshoot this issue? Our Portal version is 9.1.0.2016. @Greg_Laws - Have you restarted the platform_cache service? That's the service responsible for caching that information, not cachebuilder. I've seen some tables that do not work with the first few letters on them. I had to remove Cached_MT_ from the start of my data table to get this to work. So as you can see the table name in the database is Cached_MT_CiresonDataCircuit, but in the Dynamic data I had to just enter the CiresonDataCircuit text to get it to appear. Hope this also works for you. @Justin_Workman, that was it. A restart of the Platform Cache service and some patience has resolved my issue. New habits to build now that there are two cache services to manage. Thanks! @Brett_Moffett, thanks for your reply. I had tried this prior to following Justin's advice, and obviously it didn't help because I was restarting the wrong service. In the end, the collection that is working has the "Cached_MT_" prefix.